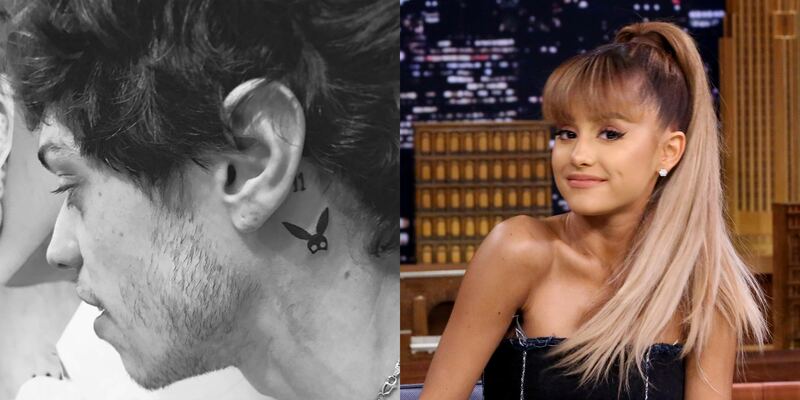 Ariana Grande did what to Pete Davidson's tattoo? Did she really cover up ANOTHER tattoo of Pete Davidson's? Are we witnessing a 'thank u, next' move played on pete davidson? from her old tattoo specifically made for Pete Davidson, to a tattoo which accolades the late Mac Miller. Firstly on October the 14th 2018 Ariana grande and Pete Davidson decided to call quits to their engagement which lasted just over 3 months as they came to terms with the speed of their relationship. with both of them on a path of success the 25 year old's soon came to term with their individual life structures and mutually concluded that it simply wasn't the right time to be together. Recently spotted by fans just minutes after Ariana grande dropped footage of filming taken behind the scene of her latest released song ''Thank u, next'' video as we get a glance of what looks like ''Myron'' as her latest cover up tattoo which happens to be the name of the late Mac Miller her ex-boyfriend's pitbull who she later adopts after his death caused by an accidental overdose. she covered the numbers '8418' which happened to be the badge of Pete's' father who passed away in 2001 on the 11th of September during the 9/11 twin tower attack as a part of his career as a firefighter. This however isn't the first time she has covered up one of Pete's tattoos previously she had a tattoo of his name on her ring finger sided by a massive black heart. the irony set put as Pete covered up the tattoo he got for Ariana featuring her at the time latest 'dangerous woman' mask and altered it into a black heart. isn't that odd? DO YOU THINK ITS TOO LATE FOR ARIANA AND PETE TO REUNITE? Let us know in the comments below!